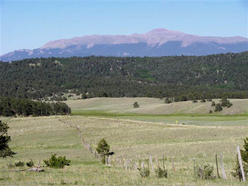 Pikes View Ranch – a site reminiscent of days gone by with an unspoiled setting bordered by National Forest and captivating views of Pike’s Peak (“America’s Mountain”). Over 200+ years ago, this area was visited and documented by an American Army officer exploring waterways under the orders of President Jefferson. He and his group were en-route from the Arkansas to the South Platte Rivers when they made camp in this region around December 13th, 1806. The officer was in such awe of “The Peak” to the east that he named it “Grand Peak”. That officer was Captain Zebulon Pike and his ‘Grand Peak’ would later be re-named Pikes Peak in his honor. Today, Pikes View Ranch incorporates improvements and a lifestyle that compliments this notable area. A handcrafted log home with vaulted ceilings and windows frame the exhilarating Pikes Peak view. The open grand room-kitchen-dining has a cozy wood-burning stove, main-level master and rustic interior finishes - pecan hardwood, slate and travertine floors and cherry cabinetry. From the spacious wrap-around decks, take in the open vistas, Colorado blue skies and star-filled nights. The upper level includes a loft/office, bed and bath and a lower level adds an optional guest /office/hobby room w/bath. Other homestead improvements blended into this ranch are a thoughtfully designed 6-stall board-and-bat barn and heated workshop (both with old style copulas), corrals, paddocks and greenhouse. 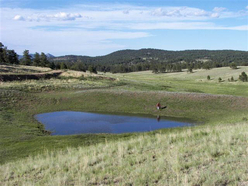 Its gently rolling topography offers livestock friendly meadows, a spring-fed pond and direct access into the adjoining Pike National Forest for endless hours of riding, hiking, hunting or exploring. Find fishing & boating at Elevenmile Reservoir, Summit County skiing and other services, shopping and airports nearby. Pikes View Ranch invites you to step back in time, follow the footsteps of early explorers, be inspired by the wide open spaces and most all welcomes you to experience your own Colorado mountain adventures.